Learn how to reveal the Milky Way in polluted skies using this helpful guide. Spotting the Milky Way on dark, cloudless nights can be a challenge for anyone, but trying to see it through the haze of light pollution in a crowded city is nearly impossible. 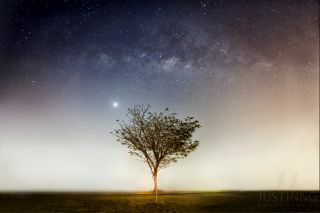 Singapore, in particular, is one of the most light-polluted cities in the world, however, that doesn't mean astrophotographers should give up hope of revealing the stunning clouds of the Milky Way above the bright city. There are some tips and tricks to use that could make those elusive photos a reality. Many tutorials explaining how to unveil the Milky Way in city photos online today do not account for Singapore's extreme light. Therefore, astrophotographers need to learn how to do more in post-processing to unveil the elusive Milky Way from much brighter locations. The amount of light pollution is usually low a few hours before dawn. Take advantage of the darker skies near midnight or during the wee hours of the morning. By pushing your histogram to the right before clipping occurs, you are acquiring as many signals as possible from your camera sensor. This technique, known as Expose To The Right (ETTR), does have its limitations. It won't work in most parts of Singapore without an effective post-processing workflow. You need to normalize the ETTR image in Photoshop or any photo-editing software before you apply your workflow to bring out the details of the Milky Way's clouds. The workflow will become more complex if the images are taken from a much brighter location. Learn more post-processing tips using this step-by-step photo tutorial developed by Ng. Follow us @Spacedotcom, Facebook and Google+. Original article on Space.com.